Cooler months mean an influx in trips to the coffee shop, but even the most yummy drinks can be loaded with unnecessary carbs and sugars that easily sneak onto your waistline and can sabotage your progress! 1.) Go for Skim over Whole or 2%. 6.) Ask for your iced coffees black with NO SYRUP. 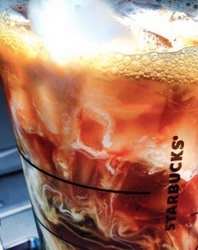 Majority of shops add simply syrup (aka pure cane sugar) to iced coffees.